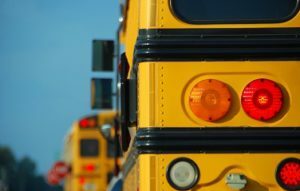 A Connecticut man is in big trouble after assaulting a school bus filled with children. According to the bus driver, Jim Berrien began tailgating the bus, and then forced his way onto the bus. The problem began at a stop sign where Berrien was behind the bus in his BMW convertible. The bus driver told police that Berrien began chasing the bus after it stopped at an intersection, and then proceeded on its way. Berrien was allegedly tailgating, and when the bus stopped, he got out of his car and forced his way onto the bus. Bus driver, Danny Castro says after the bus stopped, Berrien forced his way onto the vehicle, pushing aside a dozen elementary school students. Castro says he managed to close the bus doors, but Berrien managed to pry them open. When he got onto the bus, Castro says he began yelling, and the frightened children cowered in the back of the bus. Berrien is a former publisher at Forbes magazine. Castro says that even after he managed to get Berrien off of the bus, the angry man began hitting and beating the outside of the bus while screaming and yelling. Interestingly, the bus driver did not call police; the incident was reported by angry parents who called them to complain. Of course, Berrien’s attorney says his client strongly disagrees with the allegations and wants his day in court. Berrien is charged with breach of peace and disorderly conduct, and he was released on a promise to appear in court. Berrien claims that the bus was speeding and he stopped it for the safety of the children. However, police say the surveillance video tells a different story. Either way, wouldn’t you be furious if this man had attacked a bus on which your child was riding?